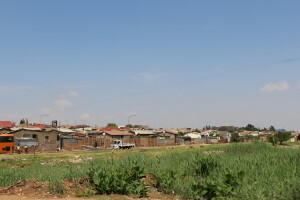 I arrived on Johannesburg (Joburg) on a Friday night and early the next morning, took a tour of Soweto (an acronym for South West Townships) with Imbizo Tours. 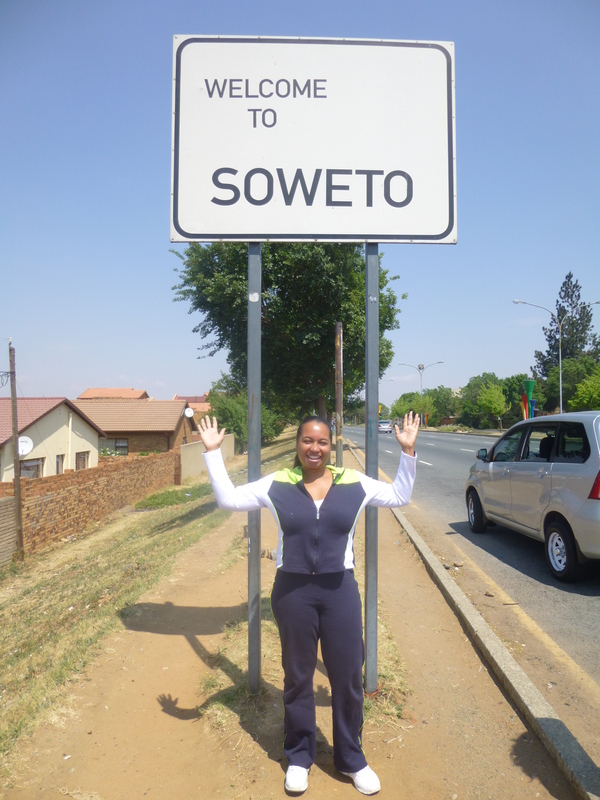 The owner Mandy, a longtime Soweto resident and the first black female tour operator in South Africa, served as our guide for the day. 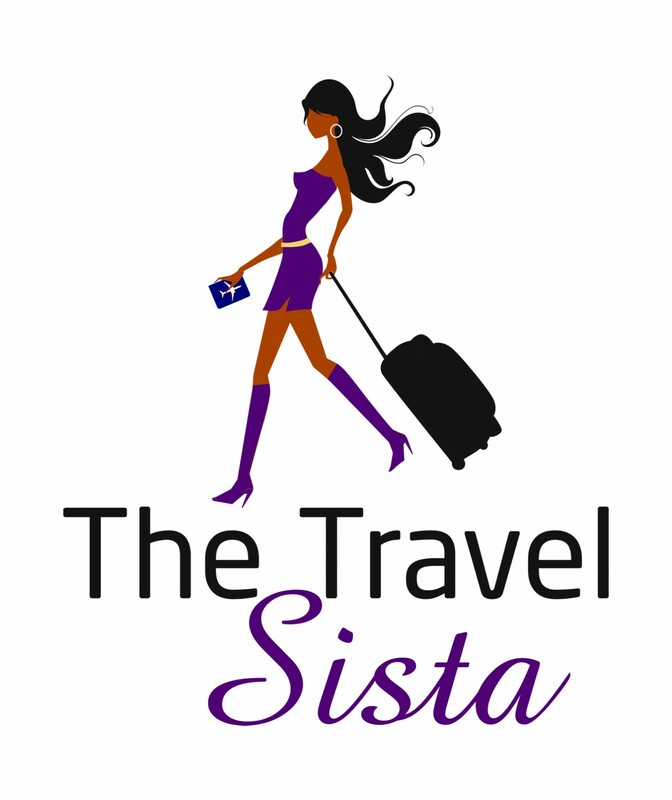 She picked up my sister and I from our hotel, then 3 more people, before heading to Soweto. I was curious, so I asked many questions about South African history and politics. We had a great discussion during the drive. 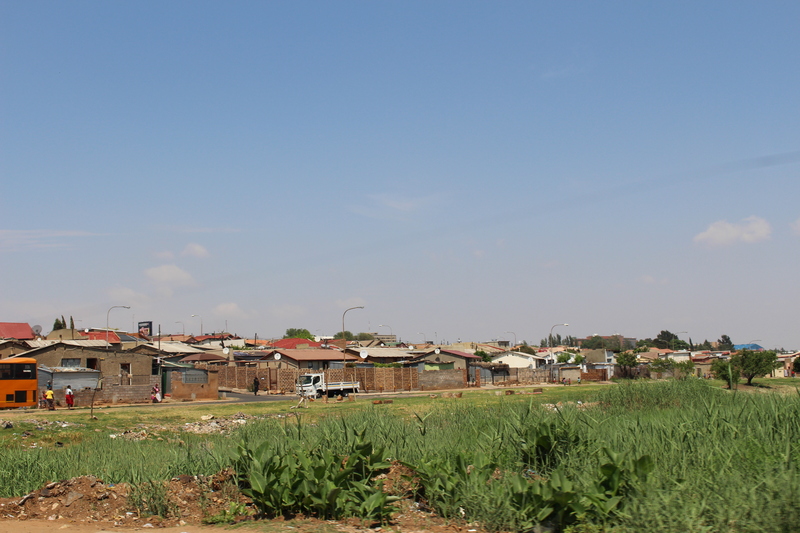 We learned that rather than being one township, Soweto is actually a group of townships south of Joburg. It is massive, predominately black (approx. 98%) and home to more than 1 million people. 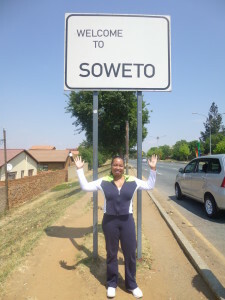 When we entered Soweto, it was a lot different than I expected. 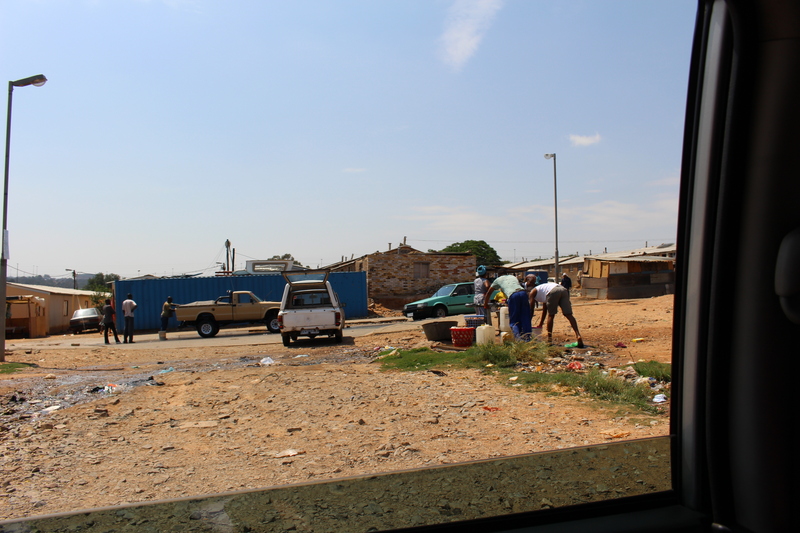 I thought the entire area would be poor, but in fact there’s a mix of middle-class enclaves, government housing, and informal settlements. We first drove thru an area called California, which Mandy told us was home to professionals such as doctors, lawyers and entertainers. The houses were fancy and large with well-manicured lawns and foliage; the neighborhood mirrored an American suburb. 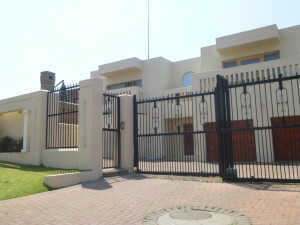 Interestingly, the houses lacked the barbed wire and electrified fences I’d seen at homes and apartment buildings in Joburg. A short distance away was a markedly different neighborhood. 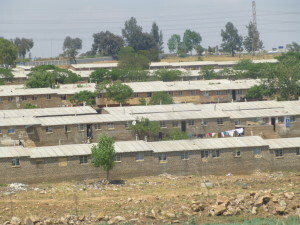 It had much smaller houses and government housing which resembled American tenements. Lawns were basically non-existent and garbage was strewn about on the street. 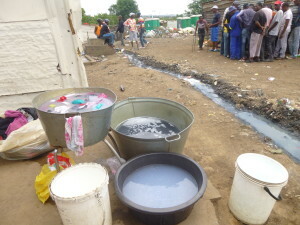 Women retrieved water from an outdoor water pump and washed clothes outside in large buckets. So close, but yet it was like a different world. We continued on through the huge area which extended further than the eye could see. 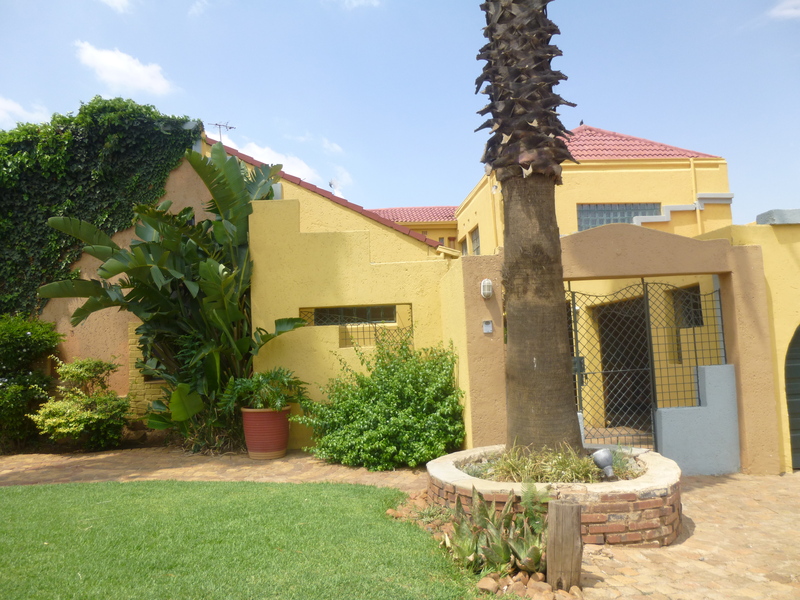 We drove around several other nicer areas – Beverly Hills and Orlando – and passed by the University of Johannesburg – Soweto Campus, Chris Hani Baragwanath Hospital, and Orlando Towers. 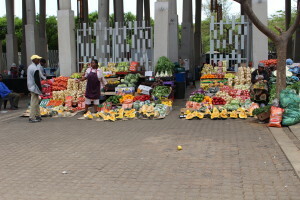 Next, we stopped at a local market near the Soweto Hotel (the only full-service hotel in Soweto, we were told). It was bustling with people buying and selling fruits, vegetables, art, jewelry, and other souvenirs. As she does with all of her guests, Mandy asked us to buy food as gifts for residents of Kliptown, which she described as the poorest area in Soweto. We bought several big bags of potatoes, cabbage, carrots and oranges; between the five of us, it only cost us about $5 USD each. 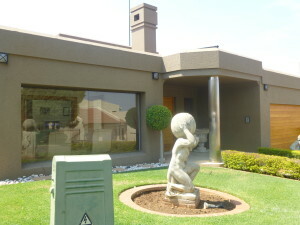 Little could have prepared us for what we would see at Kliptown. It was a shantytown in every sense of the word — all shacks, mostly made of corrugated tin, with no indoor plumbing or electricity. 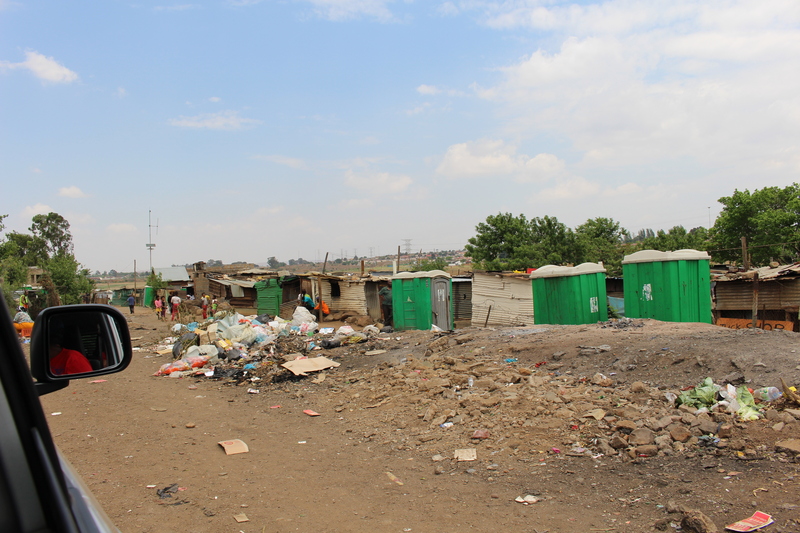 At the entrance of the community stood 3 portable toilets, which we learned serviced 13 families each. 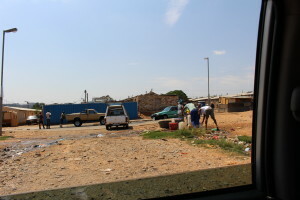 There was also a huge pile of garbage, which was the community dumping area. The sanitation department only picks up the human waste and garbage two times per week, so needless to say there was a noticeable odor. 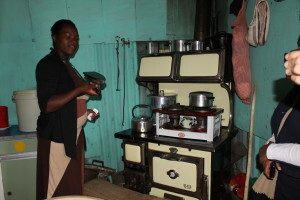 Ntoli, a young female resident, took us on a tour of the community and her shack. As we turned to the left to head towards her shack, we saw an open trench with water running through. 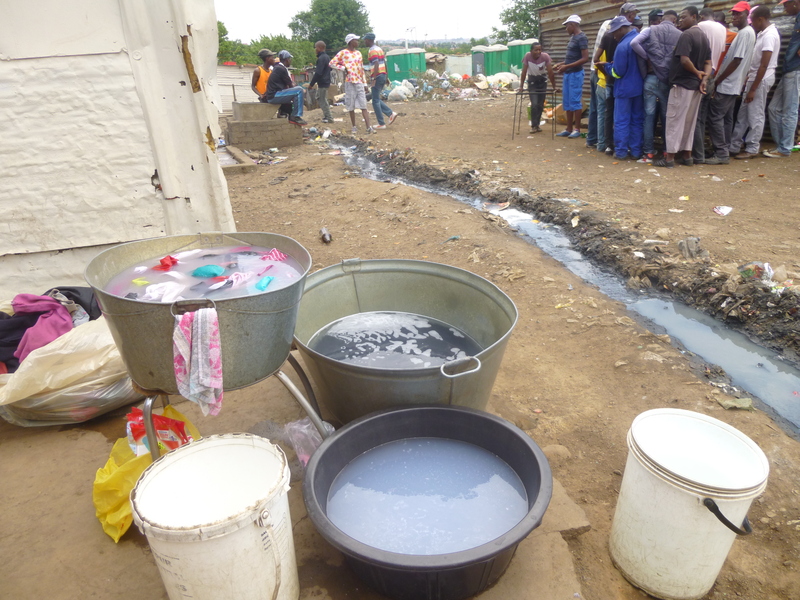 Ntoli told us this was the community water source, which led to the water pump they use to get water to drink, bathe and do laundry. It would be an understatement to say the water appeared unclean. We walked through a narrow passageway and arrived at Ntoli’s shack which she shares with 8 other relatives. The shack was approximately 18′ x 18′, with one partitioned-off bedroom, a kitchen and a dining area. It was unfathomable to me that 9 people could live there. I presume that’s why everyone was outside passing the time. The unemployment rate there is about 70%, so I guess that’s another reason. Before we left, we passed out oranges to the kids and gave food to the mothers. 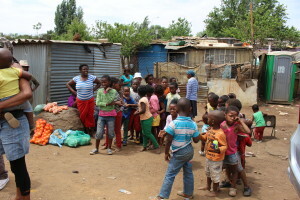 We then bid them thanks and farewell, amazed at their happy dispositions and resilience in the worst of circumstances. 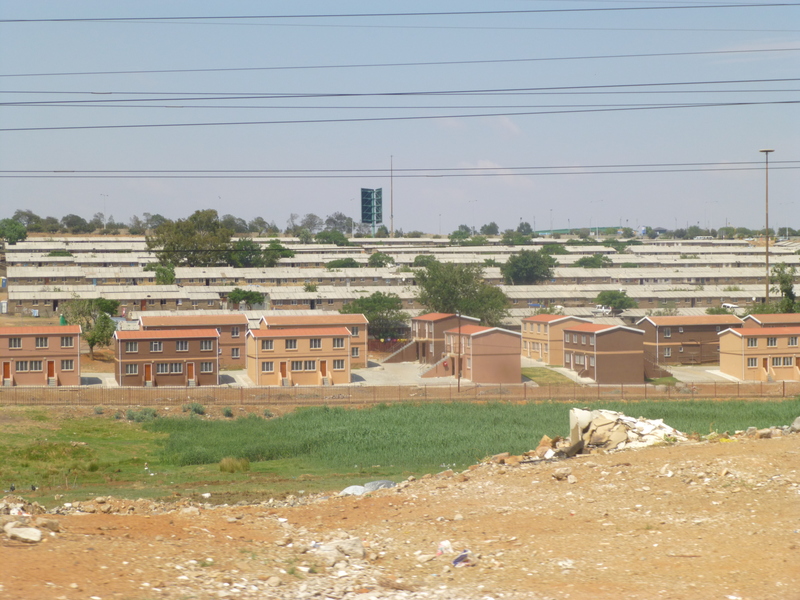 Kliptown was a sad and glaring reminder of the legacy of apartheid in South Africa. After Kliptown, we stopped for lunch at the Sakhumzi restaurant on Vilakazi Street (where Nelson Mandela and Desmond Tutu once resided). The street was lively, full of people and music. 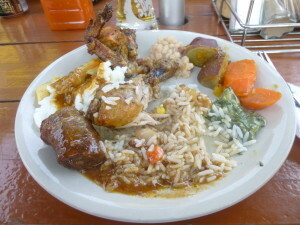 We ate from the buffet, which featured a variety of African foods, drank a beer, and had more good conversation. 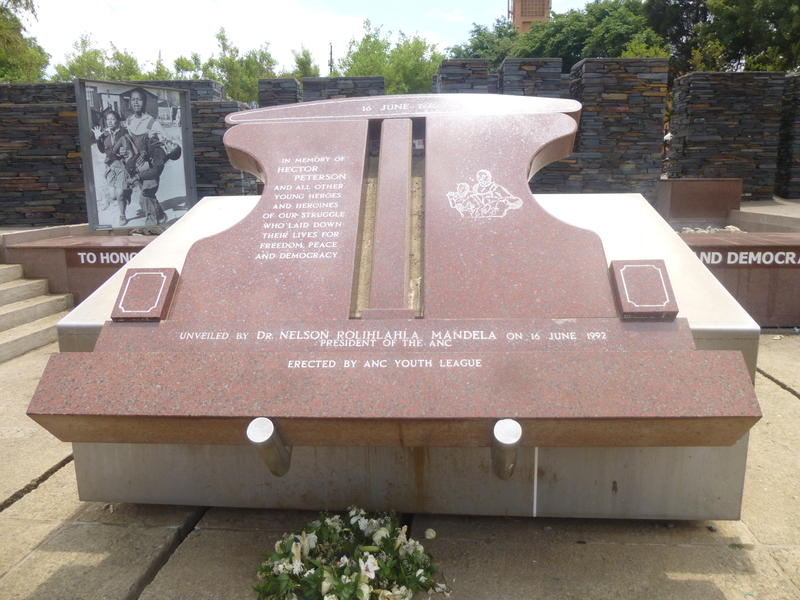 Then we went to the nearby Hector Pieterson Memorial and Museum, which is located close to the spot where the 13 year old was shot and killed by South African police during the Soweto uprising. The memorial, which was unveiled by Nelson Mandela, honors Pieterson and other student protestors who were killed or injured in the fight against apartheid; it is a fitting tribute to these young heroes. 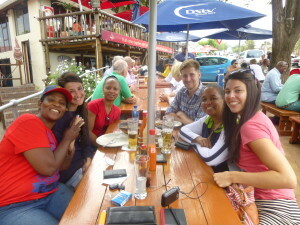 Our tour ended there and we headed back to Joburg. As I reflected on the day, I was so glad I had visited Soweto. There is an amazing history and energy there that you just won’t find in the city.